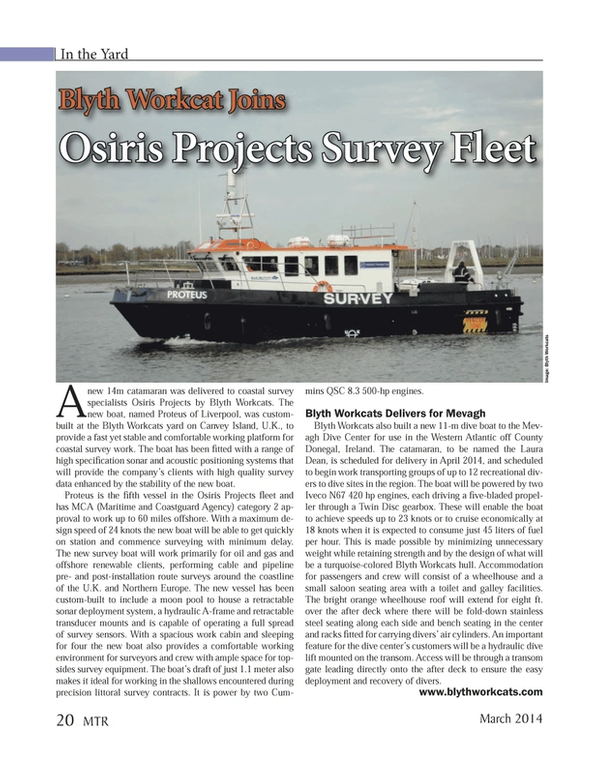 A new 14m catamaran was delivered to coastal survey specialists Osiris Projects by Blyth Workcats. The new boat, named Proteus of Liverpool, was custom-built at the Blyth Workcats yard on Canvey Island, U.K., to provide a fast yet stable and comfortable working platform for coastal survey work. The boat has been fitted with a range of high specification sonar and acoustic positioning systems that will provide the company’s clients with high quality survey data enhanced by the stability of the new boat. Proteus is the fifth vessel in the Osiris Projects fleet and has MCA (Maritime and Coastguard Agency) category 2 approval to work up to 60 miles offshore. With a maximum design speed of 24 knots the new boat will be able to get quickly on station and commence surveying with minimum delay. The new survey boat will work primarily for oil and gas and offshore renewable clients, performing cable and pipeline pre- and post-installation route surveys around the coastline of the U.K. and Northern Europe. The new vessel has been custom-built to include a moon pool to house a retractable sonar deployment system, a hydraulic A-frame and retractable transducer mounts and is capable of operating a full spread of survey sensors. With a spacious work cabin and sleeping for four the new boat also provides a comfortable working environment for surveyors and crew with ample space for topsides survey equipment. The boat’s draft of just 1.1 meter also makes it ideal for working in the shallows encountered during precision littoral survey contracts. It is power by two Cummins QSC 8.3 500-hp engines. Blyth Workcats also built a new 11-m dive boat to the Mevagh Dive Center for use in the Western Atlantic off County Donegal, Ireland. The catamaran, to be named the Laura Dean, is scheduled for delivery in April 2014, and scheduled to begin work transporting groups of up to 12 recreational divers to dive sites in the region. The boat will be powered by two Iveco N67 420 hp engines, each driving a five-bladed propeller through a Twin Disc gearbox. These will enable the boat to achieve speeds up to 23 knots or to cruise economically at 18 knots when it is expected to consume just 45 liters of fuel per hour. This is made possible by minimizing unnecessary weight while retaining strength and by the design of what will be a turquoise-colored Blyth Workcats hull. Accommodation for passengers and crew will consist of a wheelhouse and a small saloon seating area with a toilet and galley facilities. The bright orange wheelhouse roof will extend for eight ft. over the after deck where there will be fold-down stainless steel seating along each side and bench seating in the center and racks fitted for carrying divers’ air cylinders. An important feature for the dive center’s customers will be a hydraulic dive lift mounted on the transom. Access will be through a transom gate leading directly onto the after deck to ensure the easy deployment and recovery of divers.